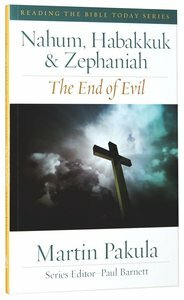 Nahum, Habakkuk and Zephaniah are seldom in the spotlight but, as Martin Pakula demonstrates in this clear and insightful commentary, these minor prophets have much to teach us about suffering, the problem of evil, and how God has dealt with it in the Israelites' day and in ours. 216 pages. About "Nahum, Habbakuk and Zephaniah (Reading The Bible Today Series)"
In 1 and 2 Samuel - Hope For the Helpless, Andrew Reid has captured the deep theology of these two pivotal Old Testament books. Andrew's insights into how the people, events, and promises of the books of Samuel point to and find fulfilment in the person and work of Jesus Christ will not serve to bore the 21st century reader. Instead they will evoke an even greater desire within the reader to search the pages of the Old Testament and, in them, discover the depth and richness of living daily in an intimate relationship with the LORD, the one who gives hope to the helpless. The letter of 1 Peter is a broad-brush sketch of the Christian life from beginning to end. Peter begins by assuring his listeners of their beginnings (a re-born ones) and concludes by appealing to them to 'stand firm' (because the end is near). Between their beginning and the end he appeals to them to behave in a Christ-like way and not to fear their enemies. This is indeed a beautifully written and spiritually powerful letter that will bring great rewards to those who study it carefully. KINGDOMS IN CONFLICT is a significant and outstanding new contribution to the excellent, non-technical READING THE BIBLE TODAY series, which is ideal for group and individual Bible study. Chaplain at Macquarie University, a minister at St Chads Putney, and a former National Director of the Australian Fellowship of Evangelical Students, Andrew Reid has extensively field tested the material in this commentary with various campus groups. An ideal resource to help you discover all that the book of Daniel has to say to you about Jesus. 248 pages, from Aquila. Esther is a book which has intrigued generations, with its powerful, action-packed narrative, in which God's people find themselves in exile, and under persecution. In this moving and astounding narrative of rescue, the hand of God which is clearly seen, although not referred to. Nor is the book of Esther mentioned in the New Testament. In his thoughtful commentary, Peter Adam takes readers through the narrative of Esther, with its amazing twists and turns, and as he encourages deeper reflection on the themes of the book, he also draws out helpful questions for Christians to ponder on today, that they too may consider that God has placed them in their situation to serve him and his people 'for such a time as this'. The book of Exodus is a keystone in the bible, crucial for understanding the epic journey of God's people throughout the Old Testament, and for geasping the key themes and events of the New Testament, especially the sacrificial death of Jesus for the redemption of all God's people. Andrew Reid skilfully and clearly explains this extraordinary book, drawing from years of experience as a gifted scholar and pastor. From slavery in Egypt to the building of the tabernacle, Andrew encourages readers to explore the amazing work of God through his servant Moses and the miraculous acts he performed to rescue his people and show the world his character and glory.